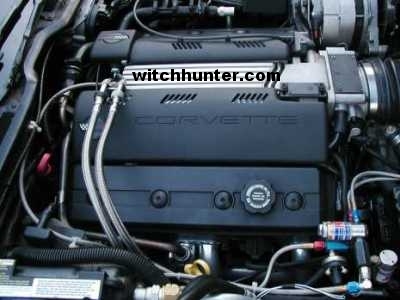 Step on in and see how to remove the Fuel Injectors on a Corvette LT1 engine. It takes very few tools and can be done in a matter of minutes. As with any automotive job, safety is a primary concern. Please use eye protection and keep any ignition sources away when working around gasoline. With that said, lets get started on a 1995 Corvette that is getting a set of LS1 injectors installed. The injectors are hidden underneath the covers on a Corvette. The passengers side cover just snaps off when pulled upward. In order to move the drivers side cover out of the way, the throttle cable needs to be removed from the bracket. Use a screwdriver to lift the plastic tab upwards to slide the cable out of the bracket. With the cable loose, the cover can be moved out of the way exposing the injectors. I used a fuel pressure gauge with a hose to bleed the fuel pressure down to zero before proceeding. The valve is located on the rear of the fuel rail. Now the injector connectors can be removed by pressing the wire clip and pulling upward. Do this for all 8 injectors. Remove the 4 bolts on top that secure the fuel rail with an 8mm socket. Also disconnect the hose that goes to the fuel pressure regulator. Lift the fuel rail upward, start with the rear then the front. The injectors come out with it. The fuel lines are still connected but swivel to allow you to set the rail upside down. Remove the retaining clips by sliding them away from the injector as shown. Carefully twist and pull the injector out of the fuel rail. That's all there is to it, and it only took a couple of tools. Simply reverse the procedure for the installation, making sure to put a little oil on the o-rings so they slide into the bores easily. Note: I will have to reprogram the engines PCM for the larger injectors.